The Americans and the Japanese decided to engage in a boat race. Both teams practiced hard and long to reach their peak performance levels. On the big day they felt ready. The American team was discouraged by the loss. Corporate management decided that the reason for the crushing defeat had to be found, so a consulting firm was hired to investigate the problem and recommend corrective action. The Japanese team had six people rowing and one person steering and rowing; the American team had two people rowing and five people steering. 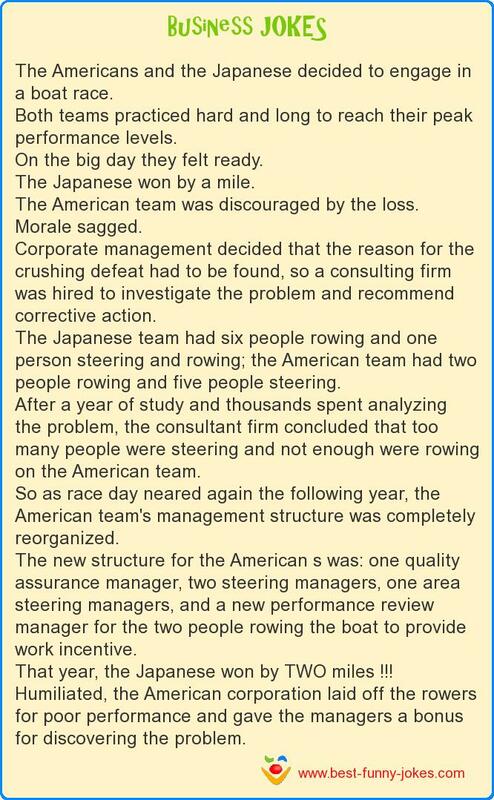 After a year of study and thousands spent analyzing the problem, the consultant firm concluded that too many people were steering and not enough were rowing on the American team. So as race day neared again the following year, the American team's management structure was completely reorganized. The new structure for the American s was: one quality assurance manager, two steering managers, one area steering managers, and a new performance review manager for the two people rowing the boat to provide work incentive. That year, the Japanese won by TWO miles !!! Humiliated, the American corporation laid off the rowers for poor performance and gave the managers a bonus for discovering the problem.